When Debbie Balogh's pug, Mugsy, started behaving strangely about three months ago, Mrs. Balogh had a feeling about what might be wrong with the dog. She was having accidents in the house, drinking more, just not acting like herself, Mrs. Balogh recalled. "I said to my husband: 'Do you think it could be diabetes?'" she said. The Temperance family was no stranger to the disease. Their now-grown daughter has type 1 diabetes. A trip to their veterinarian at Temperance Animal Hospital, 7375 Lewis Ave., confirmed her suspicion, and Mugsy is now on a special diet and must receive insulin shots twice per day. The perky dog doesn't seem to mind the shots, which go into a thick part of her neck. Daily life changed a bit for the Baloghs, however. "It's been an adjustment," Mrs. Balogh said. "We both work full time, but one of us, either me or my husband, Ken, have to come home right after work to give her a shot. There's no [pill] for it; she has to get those shots." The Baloghs have a niece and nephew who live nearby and have been taught to administer the shots in case of an emergency, and the couple can't be there. Those symptoms that Mrs. Balogh noticed before Mugsy's diagnosis are now under control with the insulin shots. Signs of diabetes in cats and dogs include drinking more water and eating more but losing weight, said Dr. Bob Esplin of Sylvania Veterinary Hospital, 4801 N. Holland-Sylvania Rd. Treatment for dogs and cats, which have an equal chance of getting diabetes, differ. "Most dogs require insulin plus diet modification," Dr. Esplin said. "Most cats are managed with diet -- canned food only -- and in some cases very low doses of insulin." Mugsy, 9, was already dealing with a special condition before the onset of the diabetes. A rare disease had left her blind a year ago. "Honestly, the blindness was harder for her and us to deal with," Mrs. Balogh said. "That was quite an adjustment for everyone. Now that she's used to it and knows where everything is in the house she's fine." The Baloghs have a senior golden retriever, Hayes, who is also "special needs." The 14-year-old dog has a hard time getting around and must be helped out to the yard with the use of a carrying harness. "I'm sure there are people who think we are crazy, carrying a blind dog and a dog who has trouble walking outside," Mrs. Balogh said. "But I don't like the alternative [which would be euthanizing them]. Why have them if you don't love them?" Nicole Knight of Toledo lost Hootie, her 13-year-old Yorkshire terrier and poodle mix, who also had diabetes, in January, 2012. He lived with the disease for five years and was given insulin shots twice per day. "In my opinion, diabetes was not a death sentence," Ms. Knight said. 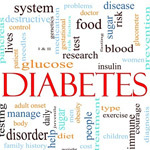 "Diabetes merely means his pancreas was not working quite right. I could not fathom putting him to sleep when a diet regimen and insulin injection twice a day would make him have a happy, healthy life." When Hootie was first diagnosed with diabetes, the Point Place resident was told he would live three more years at best. "Hootie proved them all wrong and lived five years with diabetes and subsequently died a happy little guy of mere old age," she said. "He still played, walked, and gave his little puppy kisses." Mrs. Balogh said the diabetes hasn't affected Mugsy's life other than more frequent trips to the vet. Mugsy must have her blood sugar tested once per month at the veterinarian's office. She also needs to stay on her special diet. "She's always liked people food, but we have to be real careful what we feed her," Mrs. Balogh said. "And we have to make sure she doesn't go after Hayes' food." The two dogs are best buddies and love to lie next to each other in the house. The Baloghs said they don't mind the extra work in taking care of Mugsy. "There was never any my doubt in mind that we would do this for her," Mrs. Balogh said. "She's a happy dog. We want her around as long as we can."